Thomas Edelmann: There are a number of clients who you’ve worked with in your career with whom you have developed a long-standing relationship. Plank from Ora in South Tyrol is one of them. How did Plank put itself on the map in the design scene? Konstantin Grcic: By going through pretty radical change. The history of Plank is very much connected to the area in the Alpine foothills where the company is based and its traditions. The context in which Plank was formed was that of Alpine wood architecture and the furniture created for it. The company was founded as long ago as 1893. 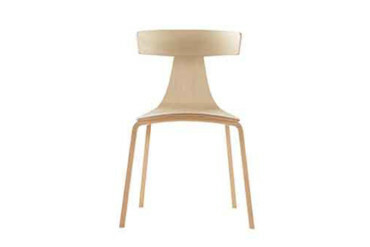 Karl Plank created hand-made traditional Alpine chairs out of simple wooden boards. Martin Plank, the founder’s grandson, attended the Woodworking Technical College in Rosenheim. He was an inventor and devised patents and machines for building the traditional chairs on an industrial scale. The company had a great deal of success with this approach. Their virtually unbreakable chairs set a certain standard in the Alpine region. Martin Plank wondered how he could build on this success. What should the company he would pass on to his son Michael look like? He consulted an advisor. Some things are hard to solve by yourself, at times you need outside support. The Planks are very good at accepting help: They listen carefully and then make their decision. What did the business consultant suggest he do? 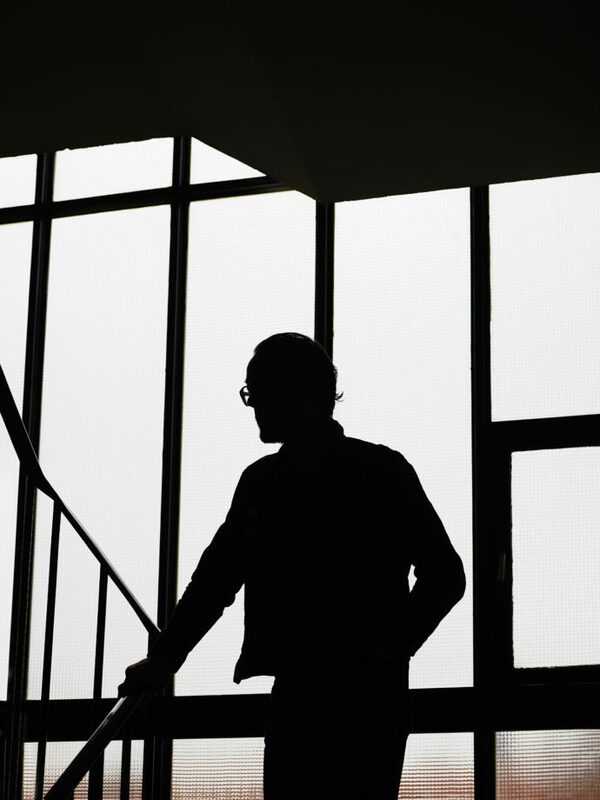 Konstantin Grcic: He prescribed a radical cure for the company. He said: “Plank, you need to pull the plug here! You don’t need all these machines any more. You need to put out feelers into the world and find out what it needs! That’s where your future lies!” Martin Plank accepted the advice. His idea was to implement it himself. This meant discontinuing his previous fabrication. A radical change that was also based on continuity? 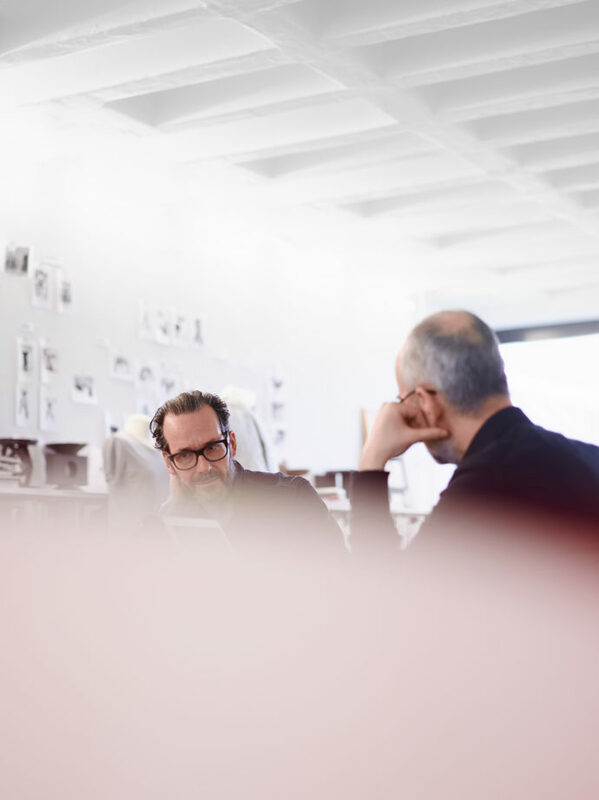 Konstantin Grcic: This change revolved around new insights, but in connection to the company background and the experience Plank had gathered. And so Plank continued to make furniture. 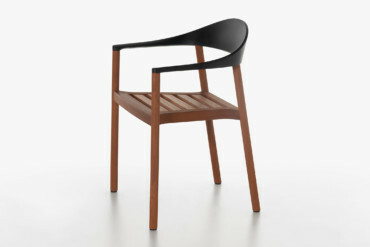 But it moved away from Alpine chairs and now opted for contemporary design instead. That’s what put the company on the map in the design world. Of course it was a slow process involving many steps that all had to be prepared carefully. Was the change already under way when you came in contact with Plank? Konstantin Grcic: The process had begun ten years earlier. The company began engaging with design – without really knowing what design was to begin with. 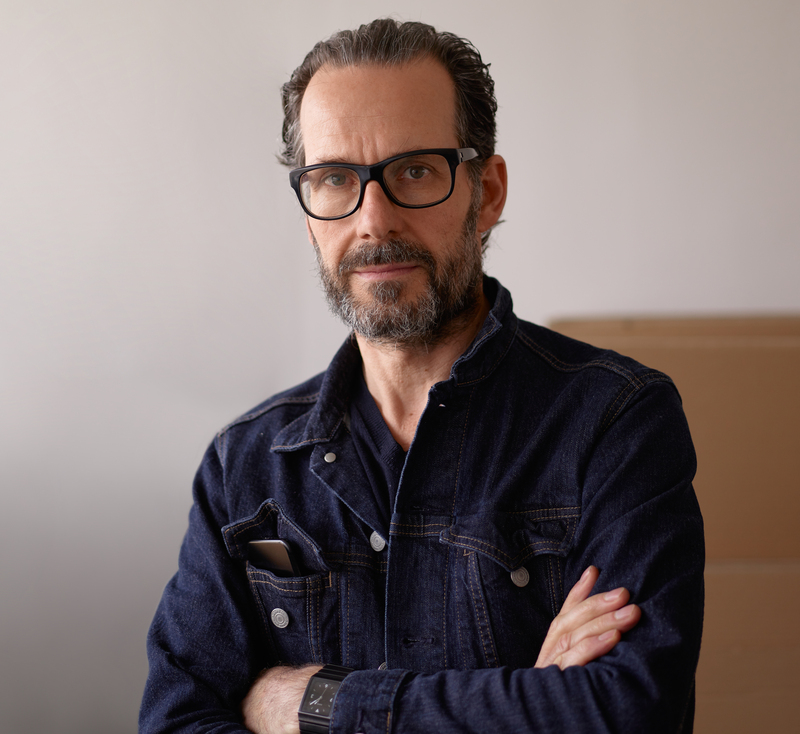 Then along came architect and designer Biagio Cisotti from Florence, who still plays a central role as an external partner, art director, and – for all intents and purposes – family member. This long-term relationship is characteristic for Plank. Today, the products are for the most part created in close collaboration between Michael Plank, Biagio Cisotti, and my office. The Italian architect and industrial designer Vico Magistretti once said design was like love. You need two to make it work – in the case of design, an entrepreneur and a designer. According to Magistretti, it was only when certain constellations and agents came together that something fundamentally new could be achieved. How important is the client when it comes to the success of ambitious projects? Konstantin Grcic: Extremely important! What we recognize as a brand is based on the decisions made by the people who established the company and built it up, who keep it in business or transform it. For me as a designer this results in a very direct relationship with the person making all of the decisions. It speeds things up when paths are short. And as Magistretti says: You have a partner in this creative process. You work together very closely and on absolutely equal terms. 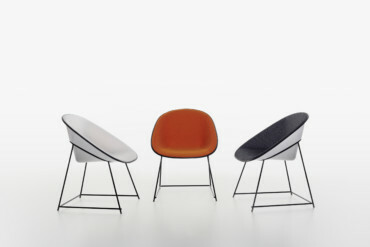 With the "Miura" bar stool and the "Myto" chair, which were launched on the market in 2005 and 2008, not only current technologies were used, but the technology itself came into focus. Did this contribute to the fact that these pieces of furniture look like contemporary icons? 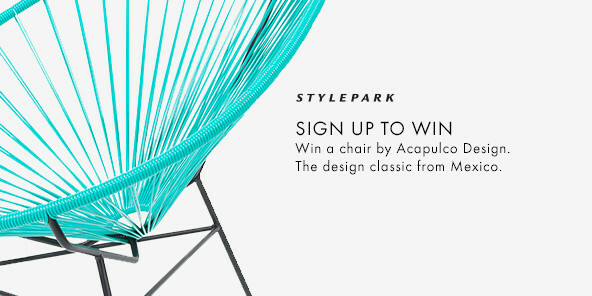 Konstantin Grcic: I can’t really give you a straight-forward answer to that question. 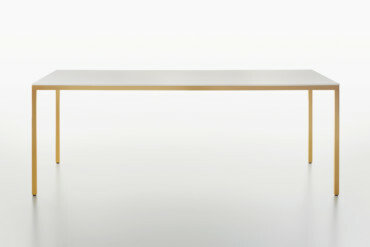 For Plank, “Miura” represented the transformation into a design company. It started off with my being brought on board to create a bar stool. That was my first project for Plank. At the time I was looking at the company from the outside. And I asked myself: What can they do? What could I do with them? I wouldn’t have dared suggest a Monobloc injection molded piece at the time. We developed that together. My design prompted Plank to say: “If we want to do this we have to go the whole hog. An investment of an order of magnitude we have never made, and using a technique that would previously have been a far cry from what we were doing.” This resulted in us bringing a great deal of energy to bear together in the course of the project. From today’s point of view it is clear that it was exactly the right decision. “Miura” is a bestseller to date and at the same time an iconic product that people associate with the brand. And it is a reference point in our collaboration that shows that courage pays off. 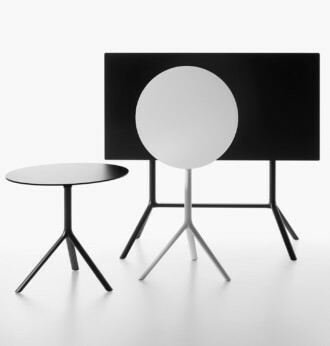 Konstantin Grcic: It shows how far you can go with a product. We took a quantum leap during the process: “We have come this far now. We need to think much bigger than we thought we could in the beginning – then everything will turn out great.” That was an important experience we shared. Was it different when you made “Myto”? Konstantin Grcic: “Myto” was a completely different story, also thanks to the additional partner involved, BASF. This meant that an outside player brought a further theme to the project. 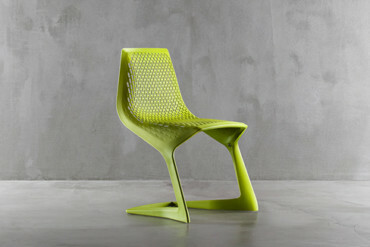 The special material used in the chair had an impact on how the design developed. “Myto” was a crucial experience for both Plank and for myself. However, I would almost omit it now. “Monza” came next, and was less taxing. We wore ourselves out a bit making “Myto”. Because everything hinged on technique and the “Ultradur” plastic? Konstantin Grcic: After creating “Myto” we asked ourselves: How can we move ahead? We essentially adjusted what Plank stands for with “Monza”. That chair brought back the skill in wood processing that Plank had acquired over the years. With the addition of a part that would definitely have been made from wood in the past, but which we decided to make from plastic. The project gave our collaboration a new self-understanding. 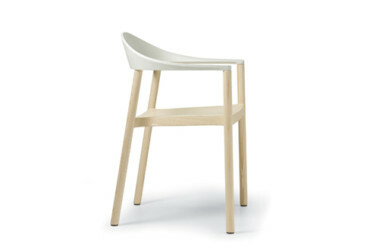 One of the latest products in your collaboration is the armchair “Cup”. It again revolves around plastics and technology, this time inspired by luggage. How does a transfer like that come about? 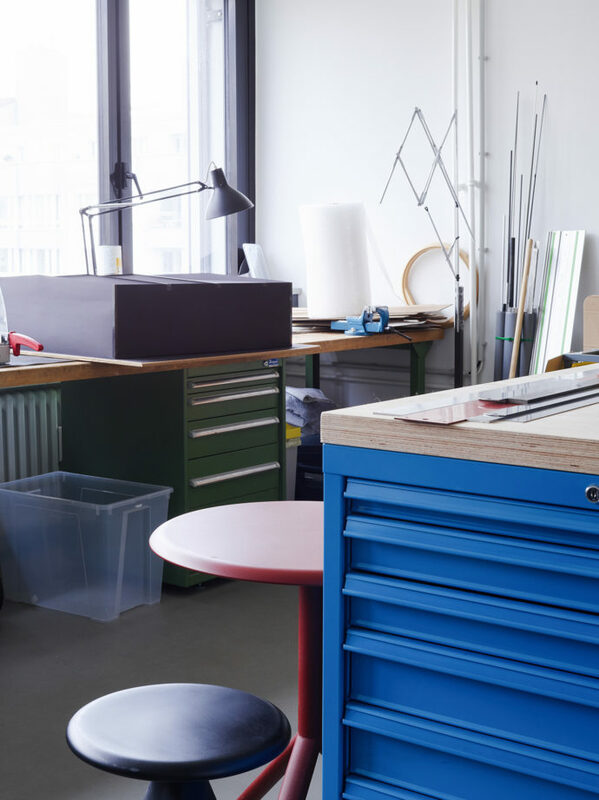 Konstantin Grcic: The furniture industry always revolves around the same typologies and ways of constructing things when it comes to these pieces of furniture. Great innovations in furniture history are few and far between, and everyone has known what they are for a long time. A material transfer opens up new opportunities for my work. Taking a plastic hard-shell suitcase as a technical model for producing a seat shell is so interesting precisely because it is more low than high tech. Deep drawing molds are relatively simple in technological terms and cheap when it comes to investment. Yet modern plastic suitcases appear very high-end. They are light, sturdy, and look great. That’s three aspects that can be perfectly carried over to a seat shell. After all, we build chairs and not racing cars. Proportionality of means plays a very important role in furniture making. Is there a further model for “Cup” in your work? 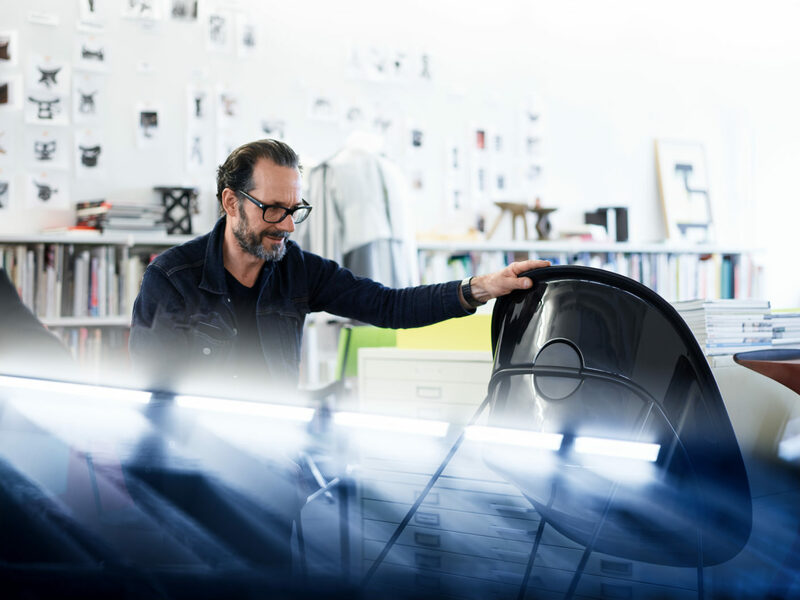 Konstantin Grcic: It is essentially an idea I had a while ago: Unfortunately, the armchair “Avus” hasn’t been as successful to date. Over the course of the dynamic design process it turned out quite complex. I still see it as a great and rather extraordinary product. But I always had the feeling that while I did get to the heart of the original idea of a material transfer from hard-shell suitcase to furniture item, I hadn’t been able to fully exploit its potential. 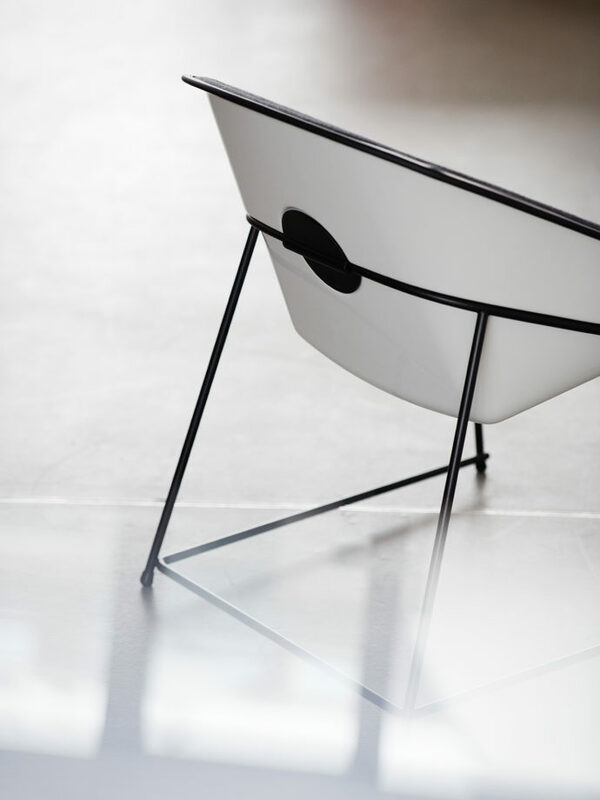 Konstantin Grcic: The material essentially calls for something very simple. And this prompted me to revisit the idea once more some years later. Sometimes this approach to a material, or having collected some experience with it, is what’s needed – at times a detour can be a good thing. You end up finding a simpler solution really easily the second time around. We ended up implementing the idea very successfully with “Cup”. What does that look like in detail? Konstantin Grcic: The shell can be stacked very easily – almost as easily as yoghurt tubs. We added a small step, in the exact place where it sits on the base frame. It is slotted in from above. 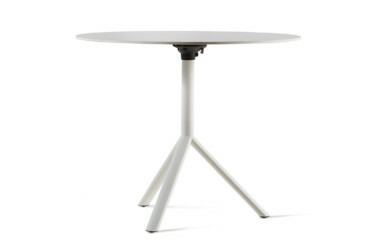 The base frame appears like a ring that runs right round. Konstantin Grcic: Yes, but everything that is above the ring can be soft and have a certain amount of give. 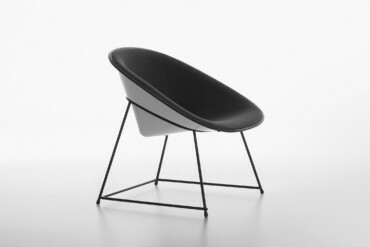 This flexibility is an important aspect, and that’s also a quality of the deep-drawn mold, while an injection molded shell or, for that matter, the Eames fiberglass shells remain rigid. In the case of “Cup” – the shell follows the movement. That makes the stable base and the fasting all the more important. The round plates created through plastic injection molding serve as connectors. A deliberately different element then? Konstantin Grcic: I found it important to highlight, in an analogy to the hand grip elements or the wheels on a suitcase. The round plates are a technical necessity, but they also function as a decorative element. They visualize the construction of the chair for all those interested. Companies like Plank deliberately only introduce one or two new products at a time. These are then modified later on. “Cup” is currently being augmented, too. And there are further innovations. Konstantin Grcic: The careful augmentation and maintenance of the collection does indeed play an important role. We have reworked many products time and again down through the years. 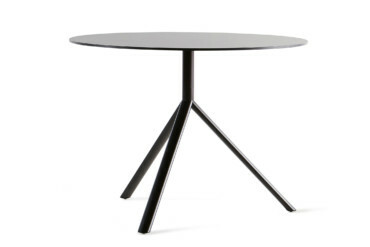 One noticeable example in this respect is the three-legged “Miura” table. I have one from the first series in my office. Many of its details have since been reworked. 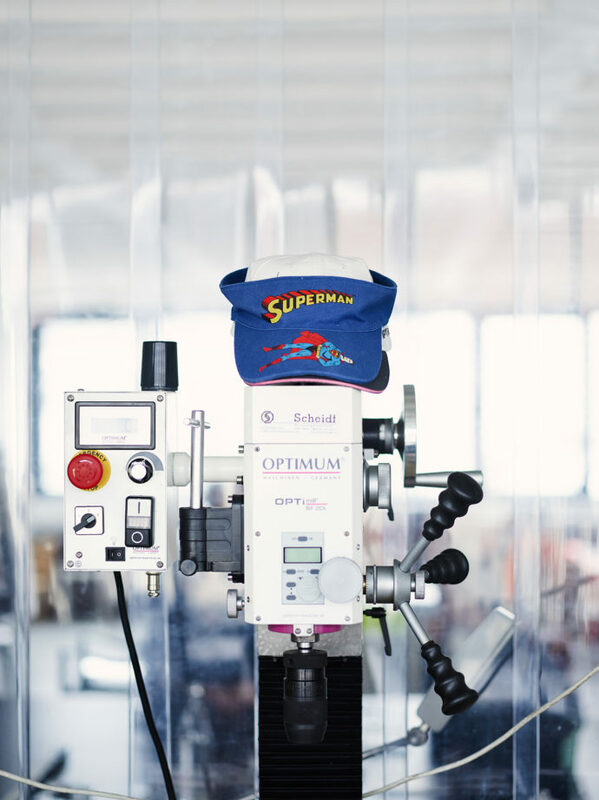 We hone the quality and make it more efficient in terms of production by adjusting manufacturing processes. The way Plank does this is quite unusual. But it’s very pleasant work for me as a designer. Not just always creating new things, but also returning to the older ones, picking them up again, changing them and optimizing them. That’s possible in particular in those cases where a company is able to bring out a piece with the fitting adjustments time and again. Konstantin Grcic: Right. And that’s how you end up with a very precise, small line for a very clearly defined market. So which changes are necessary? Going from the “Cup Chair” to the “Cup Lounge Chair” was a logical next step. 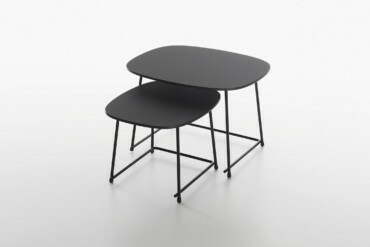 And we designed small occasional tables in two different heights to go with the chair. I have always seen the topic of the lounge as important for Plank. “Avus” was a first attempt to steer the company in this direction.” We found access to this section with the “Cup Lounge Chair”. Variety plays an important role for users. Often people also associate a specific color with a certain product. Is there a concept behind selecting certain colors for certain products? 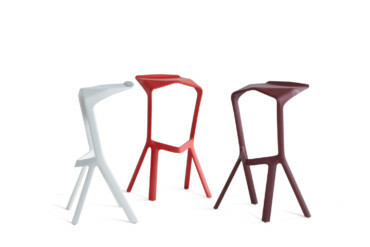 Konstantin Grcic: When we designed “Miura,” plastic injection molding made it possible to offer different colors. There is a photo that shows “Miura” in all five available colors. 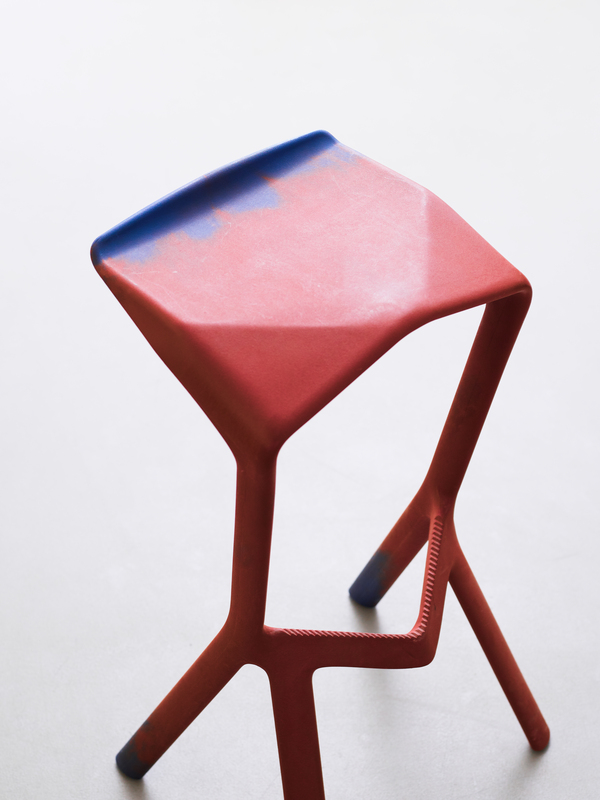 The color scheme also suggested that the stools are made of plastic. However, what ends up selling are pieces in black, white and red. I found this all very frustrating. How is it possible that the market only accepts three versions? 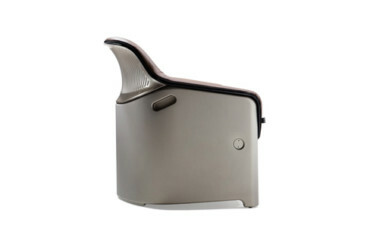 I remember a green used for the backrest of “Monza” that emphasizes the materiality of the plastic. 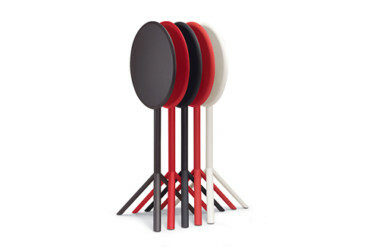 Konstantin Grcic: To begin with, the “Miura” colors became the Plank colors. And so it was a no-brainer to use the same hues again for “Monza” and “Myto”. When we were working on the plastic shell for “Remo” we wanted to break with this formula. 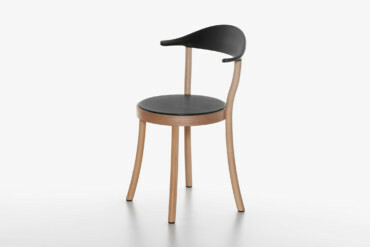 In discussion with the person responsible for the production at Plank we found out that chair frames varnished in different colors make logistics and warehousing rather complicated. He said: “If all of the frames were chrome we could have seat shells in many different colors.” And that’s what we did: Now there are twelve colors, which means we offer two shades of green, two blues, two greys, and two reds. “Remo” marks an important turning point in this way. Black and red still sell very well, but the fine-tuned color palette offers architects and those furnishing their homes many more possibilities for their planning. Would you say that unifying things in one instance creates more scope for variety in other areas? Konstantin Grcic: That’s precisely it. “Monza” also has a different color range now. The “Cup” shell is available in black or white, the frame in chrome or black. Plank recommends certain fabrics, depending on the intended use, with some geared towards the contract world and others more towards domestic use. We recommend the fabric, then the client selects the color from a large palette. The black or white shell works with almost any color combination imaginable. 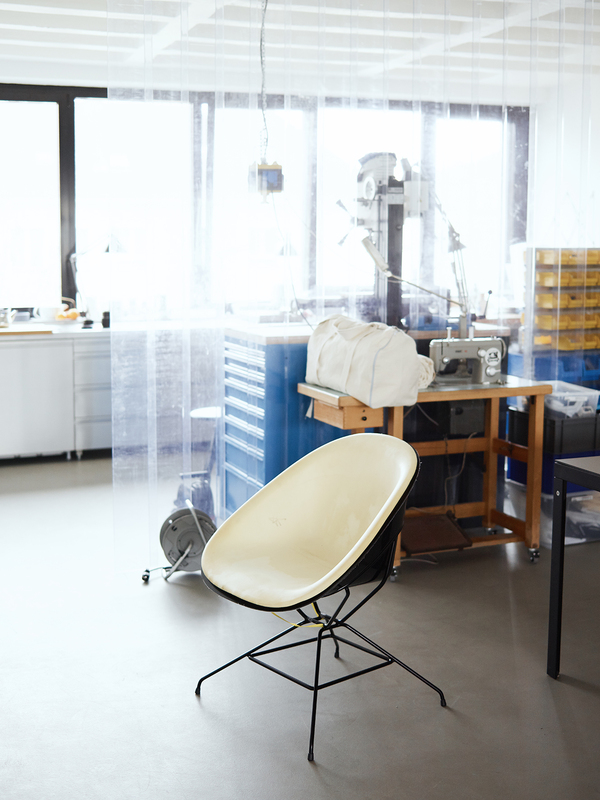 Konstantin Grcic: It sound trivial, but it took a great deal of work to get to this point. Many years of experience are brought to bear here, dedicated discussions on the individual factors. Why are we frustrated by this topic? Why is it difficult to advance in this instance? You have to ask questions to solve these issues. 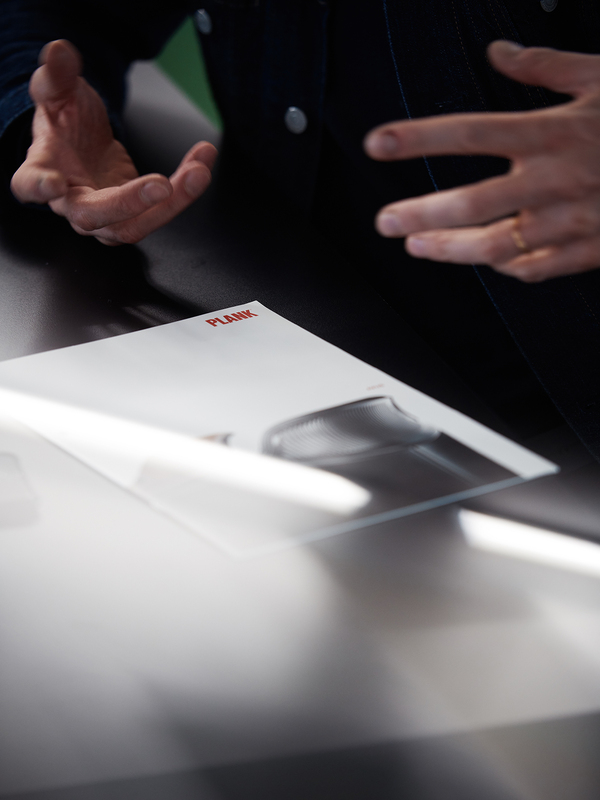 Seamless precision: milled aluminium components for the "Fila" prototype. Uniform profile and a solid laminate plate: "Fila" in silver, gold and black. 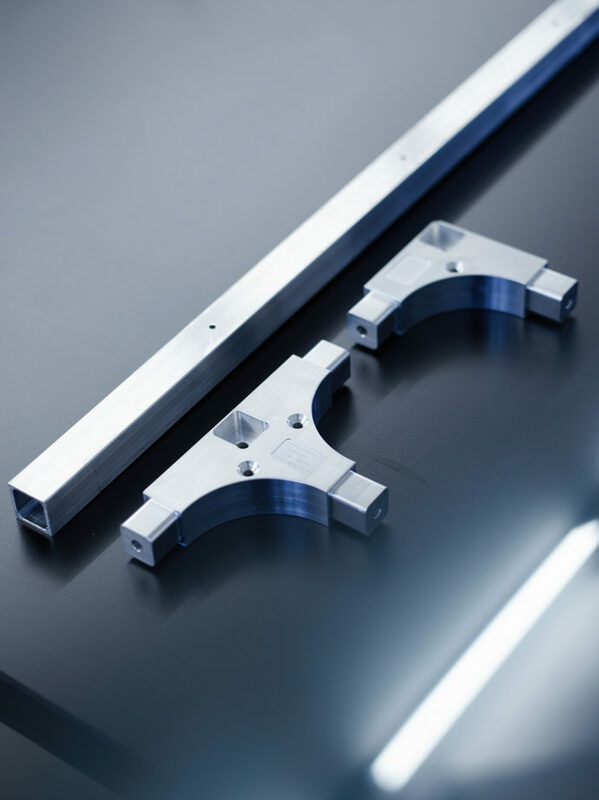 The aluminium brackets connect the extruded traverses and table legs. You’ve been working with Plank for about a decade and a half now. How has your work changed in that time? And what about your perception of design? 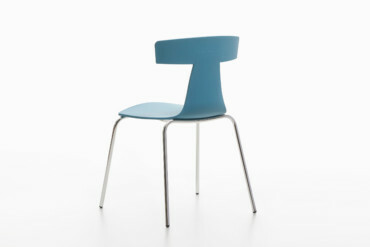 Konstantin Grcic: I have matured a great deal as a designer in these last 15 years in particular. This relates to my practice, to how we work in the office, but also to how we work together with clients. And I believe that it is precisely the long term experience of collaborating with companies such as Plank, the proximity and bond, that has taught me enormously. How do you lead the dialogue with the company? I’m convinced that an external designer is better for a company than an internal one. Despite working closely with the company I have to uphold my role as an outside player. I have to know a great deal about the company, have to be familiar with internal matters, in order to be able to judge precisely when to act out my outsider role, when to provoke and provide prompts for important changes. Then I have to engage with certain structures and particularities of the company again. Plank is Plank. It would be wrong to try to turn it into anything else. But you can propel a company forward with every product and the developments connected to it. For example with the quantum leap we took for “Miura,” or the return to the company’s core values with “Monza”. And now with “Cup,” opening up the field of lounge furniture. Then also through the topic of fabrics and upholstery, which Plank hadn’t really worked with before. Which role does design play? In relation to Plank it means introducing the right product at the right time. Plank isn’t a company that would claim to be changing the world. But its contribution to the world is developing good products in a simple, meticulous and precise way. One after the other and in a very nice rhythm. And it is building something very solid in doing so. Plus maintaining and expanding existing items. All of these are things that make a company very much of the now. 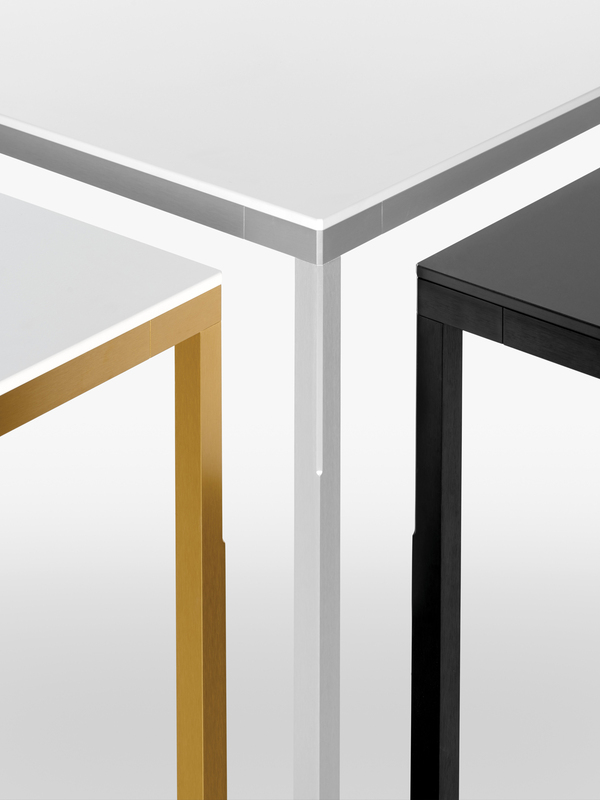 The most important Plank innovation of the year was introduced in Milan, a new modular table. Is that connected to “Cup”? Konstantin Grcic: In the same way we always aim to make a good chair we now wanted to make a good table. 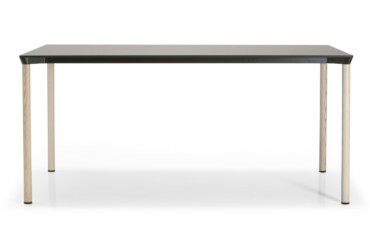 In the past we always strove to develop a table that would fit with the chairs: The “Monza” table, the “Remo” table. But we’ve moved on from that idea. Now it’s about making a good table. One that’s going to go just as well with “Remo,” “Monza,” “Cup” or chairs made by other manufacturers. 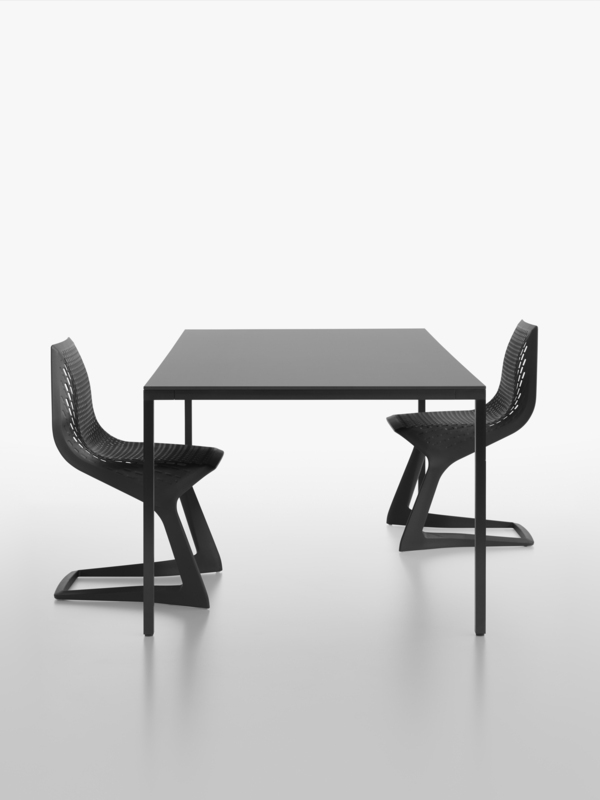 Chair "Myto" with table "Fila"
What was the starting point? 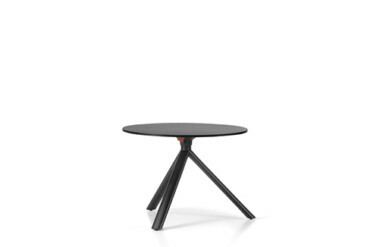 Konstantin Grcic: The essence of a table. We wanted to make something simple even simpler. A rectangular format, the legs right in the corners rather than towards the center of the piece. That kind of table already exists of course. But I was certain we would be able to do something very distinctive with this approach. 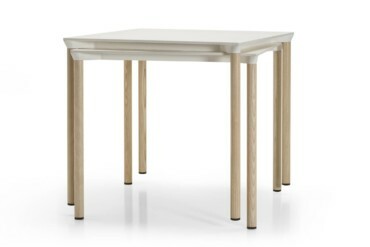 Our “Fila” table is made entirely of aluminum. And the connections are also important. We are creating building blocks that can be used to construct various table formats of any desired length. The cross beams and legs are extrusion profiles that are invisibly screwed into the connecting elements. Our corner connectors are milled from solid aluminum – in contrast to how this is generally done. 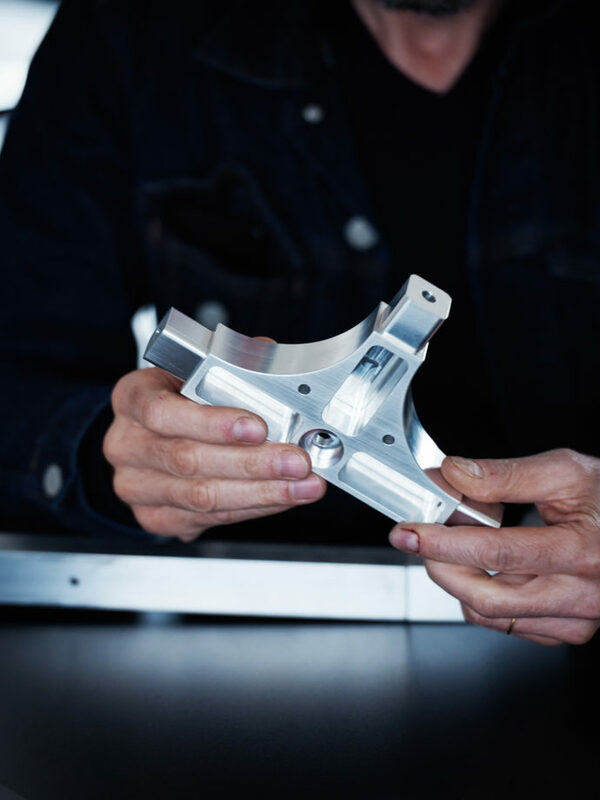 Other manufacturers mostly use a casting process, but this involves issues of accuracy of fit. For a long time milling was seen as a technique to be used in building prototypes only. Years ago, Jonathan Ive established it as the go-to method for the serial production of Apple laptops. Since then milling has turned into an industrial manufacturing process that can hold its own in competition with other procedures. 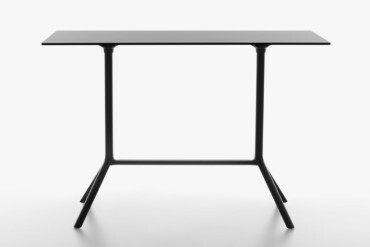 The table appears homogenous because the same alloy is used in all of its parts. 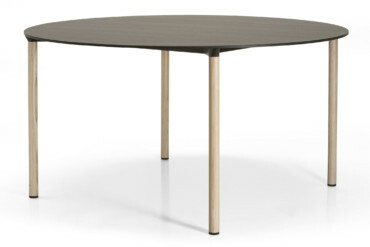 And we are able to anodize the entire table, which further heightens the quality. We have created a system that makes further applications possible. The word “Fila” means “the series” in Italian – and our “Fila” table is not just more precise, flexible and higher quality than previous simple tables. It is a system that holds great potential, be this in the outdoor segment or as a piece of office furniture. How new does a project need to be in order to hold a promise for the future? Konstantin Grcic: Even things that appear entirely new, maybe in terms of shape or the image they project, contain references to behavioral patterns, tendencies, or observations that existed previously. We don’t invent purely speculative objects. What manifests itself as new picks up on developments, addresses patterns of behavior that are in flux, and changes that can already be observed. I find this very exciting. Functional, aesthetic, extraordinary: The products by Italian firm Plank are a reliable guarantee for quality – that also goes for the Miura table. 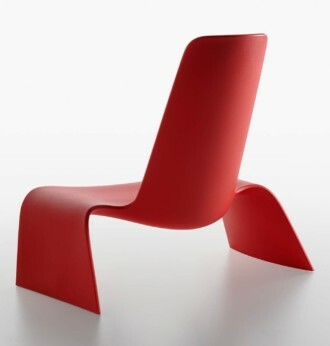 With the lounge chair “Land” for Plank, Naoto Fukasawa has created a versatile seat.